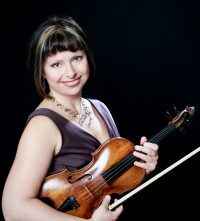 Russian-born Violinist, Elena Abramova, holds Masters Degree from the State Conservatory of St. Petersburg, Russia and a Doctorate in Violin Performance from the University of Auckland. Elena has lived in Auckland since 2003 where she is a sought after freelance Violinist, chamber musician and teacher. She has played with the NZSO, APO, ACO, NZ Trio and other professional orchestras and ensembles. Elena had been a Concertmaster of Waitakere Orchestra for 10 years, and has led a number of other orchestras, such as Aorangi Symphony, Opus Orchestra, Chinese Orchestra of NZ, NZ Concerto Orchestra, and St-Petersburg University Orchestra, having performed with some of these groups as a soloist. Elena and her husband, Violist Greg McGarity, founded Auckland Trio, which plays concerts both as a traditional classical string trio and also as a cutting-edge fusion ensemble exploring a non-classical virtuosic string music, such as Gypsy, Irish and American fiddling.